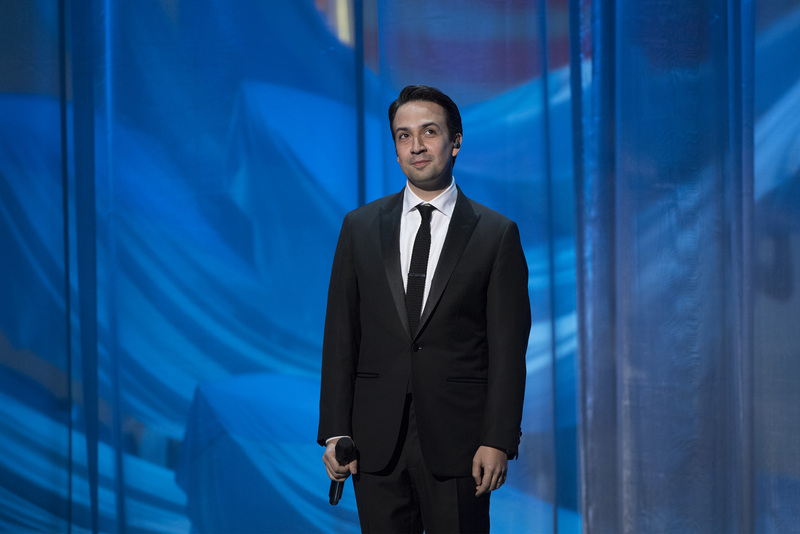 How stars like Lin-Manuel Miranda, Gina Rodriguez and more are helping those in need. Puerto Rico is still dealing with the immense damage caused by Hurricanes Irma and Maria: there are 3.4 million residents in Puerto Rico “with limited resources and no power,” according to the Huffington Post. But in times of crisis, help can come in unexpected forms: many celebrities are using their platforms and resources to raise awareness about the damage Puerto Rico sustained and send aid to those in need. Check out these examples of celebrities doing more than posting a quick tweet and remember that there are always ways to get involved and help people in need. The writer, musician and activist has been outspoken about the crisis in Puerto Rico both online and off, partnering with organizations like MoveOn to raise money to help. He’s also been using his wide social media reach—1.76 million followers on Twitter—to “signal boost” tweets from those in need on the ground in Puerto Rico and amplify their message, in addition to posting important reminders of ways to help like donating blood or money to the many places affected by the recent hurricanes amidst ongoing crises like the shooting in Las Vegas. The DC-based chef has taken his non-profit World Central Kitchen to San Juan to set up mobile kitchens (via food trucks) to feed as many people as possible, according to Conde Nast Traveler. Eater reports that he’s been working with fellow chef Jose Enrique, who has a restaurant in San Juan. The two are working to “prep food at Jose Enrique’s restaurant and then send the trucks out to the neighborhoods that need food the most,” including to hospitals, according to Eater. Kroll and Colbert’s #PuberMe hashtag campaign is a light-hearted yet effective way to rally support for Puerto Rico. The two comedians announced the initiative on The Late Show with Stephen Colbert, saying that they’d make a $1,000 donation to hurricane relief efforts every time a celebrity posted a photo of themselves during puberty and used the hashtag, according to Today. The tag is certainly worth a closer scroll on social media, and the idea behind it shows that viral campaigns can provide much needed levity and aid when they’re connected directly to donation efforts. You can see a roundup of some great ones here. The Puerto Rican actress and activist has been updating her 395,000 Twitter followers nonstop about the best ways to get involved and provide aid to relief and recovery efforts in Puerto Rico. (She’s been tweeting about how to help victims of other crises like the earthquake in Mexico, too.) Rodriguez recommended donating to Voices for Puerto Rico / Voces por Puerto Rico, a grassroots initiative that gives directly to rural or disconnected communities in need. She also took part in the #PuberMe campaign. CNBC reports that Cuban “loaned the Dallas Mavericks’ private plane to point guard J.J. Barea to bring essential supplies to his native island.” Barea is the only active Puerto Rican player in the NBA, according to CNBC, and has also raised more than $130,000 through a fundraiser to help with hurricane relief. The rapper sent his private plane to Puerto Rico “to transport cancer patients to the mainland US for chemotherapy treatments,” according to CNN. At the time of CNN’s reporting, only 11 out of 69 hospitals on the island had fuel and power. Other celebrities who’ve been supporting Puerto Rico’s recovery and aid efforts include J-Lo and Marc Anthony, Mark Ruffalo, Lady Gaga, Beyonce and Jay Z (TIDAL announced plans to charter a plane with hurricane relief supplies) and Jeff Bezos, who posted a picture on Instagram of an Amazon plane landing in San Juan filled with critical supplies. These efforts show that while tweeting can be directly tied to donation, it’s important that people with such vast platforms and influence put them to use beyond sending thoughts and prayers.